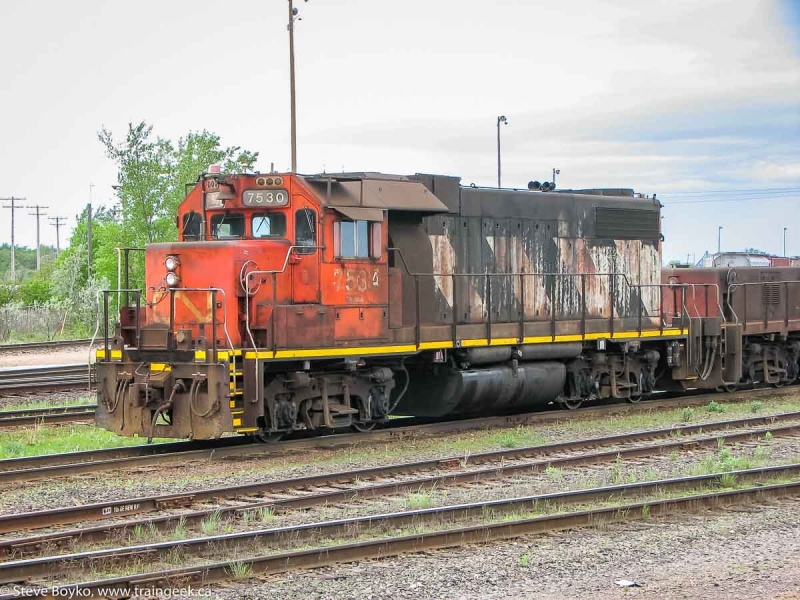 I stumbled across this locomotive a while ago, in Redwater Alberta, north of Edmonton. This GP9 is used to switch a local gas industry. RSSX 3756 shunts these tank cars. There is a great RailServe roster page. Well, enough spammers have commented that it's time to turn comment moderation on. I apologize. On Monday evening (June 21) I drove south from Phoenix, Arizona to see some Union Pacific action at Maricopa. You may remember I was in Maricopa in November 2009. It didn't take long for the first train to come along. I saw headlights to the east when I was driving past the cow feedyards, so I stopped to get the shot. UP 7770 and UP 4564 led a bare table train. I understand there are tens of thousands of cows there. The smell is unbelievable! I made the mistake of leaving my car door open for a bit and the smell, and flies, got in the car and it took a while to get rid of both. Apparently the cows are going soon. Within ten minutes another westbound train came along, with UP 9657 and UP 4080 and a short autorack train. After those two, it was quiet for a while. I went and grabbed some supper, and when I was driving back to the tracks, I saw the gates going down. I jumped out of the car to get this sunset shot. This train had four engines, UP 7915, UP 8446, UP 4725 and UP 7762. In Arizona, when the sun goes down, it gets dark FAST. That was my last train that night. I was there for a good time, not a long time! Here's a slide by David Stowe from June 26, 1994. It features CN 3578 on point with fellow MLW unit 2307 and SD40 5071 trailing. The slide was taken in Hamilton, Ontario. Strangely enough, 3578 was the newest of the three units shown. CN 3578 was an M-420(W). It was originally built as CN 2578 in 1976, but along with many M-420s it was renumbered to the 35xx series when it had its weight and fuel reduced for branchline service. CN 3578 found a new life on the St. Lawrence & Atlantic Railroad in 1998, then was sold to the Southern Railroad of New Jersey in 2003 (CN Lines web page). There is a photo of it here showing it with SRNJ lettering but still in CN stripes. CN 2307 suffered a worse fate. It was an older unit, an M-636 built in 1970. It was retired on January 31, 1995 and scrapped just over a year later. CN 5071 was an SD40 built in 1968. It was retired on November 27, 1998 and was sold to National Railway Equipment. It is apparently still in operation today, in Union Pacific colours. In late May, I convinced my wife to stop briefly at Indian Head, SK so I could shoot the grain elevators there. This is not a comprehensive view of the elevators but a brief glimpse of yesterday's and today's elevators. Did you know that Indian Head had twelve grain elevators in 1905? In 1902 it was the largest initial shipment point of wheat in the world. Even now, with three elevators (of which at least two appear active) it appears busier than many Prairie towns. I'll have to take more detailed photos of these elevators the next time I pass through. I also want to stop at Sintaluta nearby, as their elevators look pretty interesting. Is CP taking over Symington Yard? No, but this photo by Jeff Keddy illustrates one of the trains CP is detouring over CN between Calgary and Winnipeg, due to the washout near Maple Creek, Saskatchewan. Extremely heavy rains in the area washed the tracks, and the Trans Canada Highway, out near Maple Creek. Since then, CP has been forced to detour its trains through the US and over CN to keep the traffic moving. Apparently about 200m of track was washed out near Medicine Hat. CBC article, CP bulletin. EDIT: Updated to reflect the fact that Maple Creek is in Saskatchewan, not Alberta. Oops. As I mentioned in my previous post, after a bit of early evening railfanning outside Calgary, I was not done with my train chasing for the night. After a quick stop at my hotel, I decided to go see the Ogden Shops in Calgary. The directions are easy - go to the Ogden Road and you'll see them. I saw the shops, and shortly thereafter I saw CP 1601 and CP 1648 running light toward them. Both of these units are GP9s. 1601 wears the short lived CP Rail System livery while 1648 sports faded CP Action Red with the multimark. I saw a boatload of units at the Ogden Shops. You can view the day's sightings for a complete list of what I saw. It's not the easiest place to shoot without trespassing. I didn't get many decent shots because of this, but I did see a few interesting units, such as CP 1000. This unit was built as an SW1200 for the Milwaukee Road, before being acquired by CP's SOO lines and eventually being turned into a slug in 1996. It still has its cab (unusual for a slug) and sports a very simple lettering scheme. Note the lack of exhaust stacks (slug=no engine). That was all very exciting, but I decided I wanted to see the famous Alyth yard while I was here too. A short drive brought me to the Blackfoot Trail, which goes over the north end of the yard. I found a place to park and started to walk toward the overpass when I saw... classic passenger cars... on CP... this could mean only one thing. The Royal Canadian Pacific was in town! I sprinted toward the overpass while uncasing my camera and ripping the lens cap off. They headed out just as I reached the top of the overpass, so I shot this video of their departure with my Canon T1i . After they left, I took inventory of the yard. CP 9808 and 8871 were running light. CP 6065 and 6614 were working hard shunting the yard. CP 9808 and 8871 ran past them to couple onto their train. There were lots and lots of engines on the south side of the overpass. Unfortunately there is no walkway on that side, but I was able to take inventory of most of the units there. As I said, you can view the day's sightings to get a complete list. That was a special moment for me to see the Royal Canadian Pacific train. I'm glad I was lucky enough to catch it. I was in the Calgary area again late last week. In the early evening I was southeast of Calgary, heading back in, and I saw a few trains on Canadian Pacific Railway's Brooks subdivision on my way. The first train was a local switching an industry at Carseland. Three GP38s were shunting cars. They were a bit of an odd triplet, with modern block lettered CP 3078 leading, CP 3131 with the beaver emblem in the middle, and CP 3074 complete with multimark trailing. I noticed a CP train stopped on the mainline, near the Viterra elevator in Carseland. I figured they were meeting another train, until I got closer and realized there was no crew in the train. CP 8715 and CP 8561 were just short of a rural crossing. Looking down the track, I could see the end of the train was still on the mainline while the head end was well into the siding. I guess they couldn't fit the train in the siding without blocking a crossing, so they fouled the main. I headed toward Calgary, but it wasn't long before I decided to head off the road to Dalemead. This place appears in the CP timetable so I figured there must be a siding there. After about 4 km of gravel road, I arrived at the tiny community of Dalemead. There is indeed a siding there, as well as some stored freight cars. Looking toward Calgary, I saw the signals were lit red. Now, CP generally uses approach lit signals, meaning they only show lights if there is a train near them. The red lights told me that A) there was nothing going toward Calgary (I knew that anyway because of the train fouling the main at Carseland), and B) there was a train approaching from Calgary. I waited and sure enough a general freight rolled slowly into view with CP 9826 and CP 9504. VIA Rail posted a notice of potential work stoppage aka possible strike by the Canadian Auto Workers. The union has been negotiating since October 20, 2009 and their contract expired at the end of 2009. They voted 94% in favour of a strike earlier this year. The strike would involve on-board staff, clerical workers, ticket vendors and maintenance workers. VIA's contingency plan has VIA attempting to operate most Corridor trains and running the other long distance trains such as the Canadian, Chaleur and Hudson Bay once a week. Hopefully they can resolve their differences. The engines that work the hump yards never get the respect they deserve. These are engines that work hard, constantly shoving long strings of cars up a steep hill, only to go back down the hill and do it again with another string. I thought I would take a few pictures of these unsung heroes. 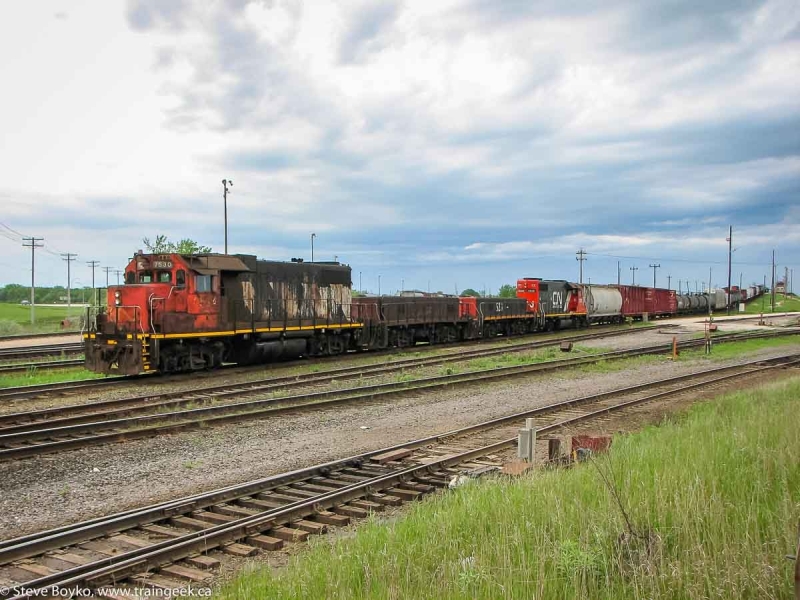 On May 29, 2010 there were three sets of engines working the hump at Symington Yard in Winnipeg. The pictured units, CN 7530, slugs 500 and 523, and CN 7513 were shoving their cars up the hill. The two end units are GP38s modified for humpyard service. CN 500 and 523 are slugs, aka "daughters" or "calfs" that have electric traction motors but no diesel engines. They get their power from the "mothers" aka the humpyard GP38s. Slugs are used in low speed operations like shunting because the diesels and their generators produce more power than one locomotive's traction motors can use. Humpyard units are generally remote controlled. That allows the operator to stand at the uncoupling end and have the units shove the cars at his/her beck and call. One thing I did not know is that the two GP38s in the sets are not identical. One is the "lead" and the other is the "trail" unit. The remote control receiver is in the lead but the "trail" is likely just MU'ed to the lead so they work together. Some of the humpyard dogs are pretty beat up. 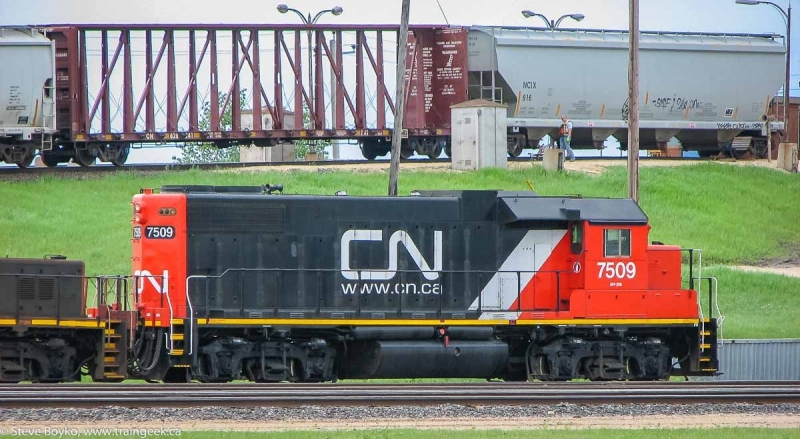 Look at CN 7530 up close... or is it 7534? The paint is so bad on CN 7530 that you can see its former number, 4734, showing through. 20 years after being renumbered, hard living is renumbering the engine back. Note the light above the bell. This flashes, indicating the unit is remotely controlled. The second set at work was on the back track on the hump, and I didn't catch any numbers except for CN 7521. The third set was resting beside the hump. CN 7528, CN 504, CN 501, and CN 7509 were having a rest. Clearly CN 7509 was recently repainted! Note the operator on the top of the hump above 7509. He has his beltpack to remotely control the dogs. I hope you have enjoyed this introduction to the "humpyard dogs" at Symington Yard. These dogs don't get any petting, but they work hard anyway! It is listed as a siding, although to my eye it looks like a yard. I guess the reason for that is so trains can proceed on the main line at track speed rather than "reduced" speed. I spent a little over an hour at Keith around sunset. You can see all my sightings here. When I first arrived, there were two trains sitting in the yard, apparently waiting to head west. The first was an intermodal train with CP 8755, CP 8715, CP 8886, and CP 8574. Three ES44ACs and an "old" AC4400CW trailing. The crew came out and took positions on both sides of the main line to inspect a train. Soon enough CP 9738 East came rolling through. After that, it was 8755's turn to head west. I moved down to a little parking lot and shot them from there. You can see the Bow River in the background. A quick rain shower came through and I got pretty soaked before aborting the taping and running for the car. The second parked train did not have a crew, so it was clearly not going anywhere soon. I saw that RCMP unit CP 9501 was the second unit. I already talked about the cabooses I saw at Keith. The "catch of the day" was the last train I saw there, CP 9804 West. I heard them rolling through and took position down at the parking lot again. Just as they were coming into view, the last rays of sunlight shone through the clouds and made a rainbow. The train had CP 9804 and 9703 on the head end, and CP 9713 mid-train. There were no other trains imminent, and it was getting near to 10 PM, so I headed out. The rainbow really topped off the evening for me! The Daily Gleaner reports that work should resume on the Fredericton train station in July of this year. They have been waiting for approval for their plans to restore the front part of the station, and build the liquor store annex on the rear where the freight shed currently stands. Approval has been given by the federal cabinet, but the Historic Sites and Monuments Board of Canada must sign off on the final plans and that has not happened yet. After the rush to replace the roof, nothing has happened in the summer to date. I'm glad to hear there is planning work going on behind the scenes. tjmfishing put a video together detailing the history of the Gaspe line. It features some of my photos as well as some from David Morris. I like the music, from October Sky . That was a great movie. I'm late on reporting this one. I was out of town when it occurred and more details are still coming out. A garbage truck drove into the side of a southbound CP train at Leclaire Road south of Winnipeg in the regional municipality of Ritchtot (here on Google Maps). This is the CP Emerson subdivision connecting Winnipeg with the United States, and it sees a fair amount of rail traffic. It is a few km from my house and I can hear the CP crews blow the horns several times a day. News articles state the truck was proceeding east when it struck the train at 7 AM Monday. The truck driver had the sun in his eyes, no doubt, but the road and the rail line are both dead straight there and the view should be unobstructed. Photos show no crossbucks and the article calls the crossing "uncontrolled". There is a crossing warning sign. The driver was taken to hospital with "non-life threatening injuries". News articles state he was 43 years old and suffered a broken arm. The truck (owned by Johnson Waste Management) actually drove into the side of the second locomotive, SOO 6041, just behind the cab. The train had 86 cars, 26 of which were empty. News articles mention sulphuric acid and sulphur were on the train, but photos show a double-stack container car beside the wrecked truck. About 4000l of diesel fuel leaked from the SOO engine. Articles state 10-12 cars were derailed, and judging by the photos and video, most if not all were container platforms. It looks like the train separated several cars behind the engines. The rail line was back in service by 10 AM Tuesday. There is an excellent Global video report. Articles: Canoe, Winnipeg Free Press, CBC, CJOB (with audio), CTV, Winnipeg Sun, Global TV. The CP track evaluation train (led by CP 8205) is in Quebec this week, testing on the QGRY. On Monday it will travel on the MM&A through Maine and do the NB Southern Railway later next week. Get your cameras ready! Steve M from BNSF sent me a link to BNSF's virtual train tour. It has photos and video describing train engines and cars, how they are used, and other interesting details. I invite you to check it out. I dare say these two cabooses are at the end of their days. These two are in a little yard on the Bow River just west of Calgary. One question my wife asked me when I told her I wanted to purchase a Canon T1i was: we have a perfectly good camera, what will you gain with the new camera? CP 8800 and 9629 led a train through Indus, Alberta on Sunday evening, after sunset, and I still got the shot. From past experience, I know that when the sun goes down, the Canon S3 goes back in the bag. It simply cannot shoot a moving subject in low light. Impossible. However, the T1i can do it. This shot was taken with a shutter speed of 1/400s, aperture of F/4.6, and ISO 1600. The S3 is not capable of ISO "film" speeds greater than 800, and ISO 800 looks terrible on the S3. And this was with the KIT lens! DISCLAIMER: I did bump up the brightness and reduce the contrast a bit when editing these photos. I was shooting JPEGs, not RAW. They still looked good right off the camera. Here's the tail end of the train, with CP 8542 giving a shove. I am very impressed with the T1i's capabilities. Very impressed. Not 300 the movie... this is about two trains numbered in the three hundreds. Specifically, 301 and 304. On the evening of June 10th, I was standing on 156th Street NW in Edmonton just north of the Yellowhead Trail. This is the east end of CN's Bissel yard, on the CN Edson subdivision. I saw train 304 was waiting to head east across Edmonton, with CN 5761 and CN 5703 at the head of a train consisting mostly of paper products. After a while, they got their light... yellow over yellow, meaning "Clear to Slow" - proceed, approaching next signal at slow speed. They slowly pulled out of the yard and went under me. As they did that, CN 301 came around the corner east of me, and passed under me on their way west. This train had CN 2304 and IC 1027 on the head end. CN 301 had engine 2238 mid-train... nice to see! Once those two had passed, I went back to my car and headed east. I saw CN 304 threading its way past Calder Yard. I went to East Junction, where the CN Vegreville subdivision meets the main line, and where I railfanned back in 2004. I waited by a baseball field and soon enough 304 came along. It was getting dark, so I decided to head back to the hotel. On my way, I noticed that CN 304 had stopped on the high bridge over the North Saskatchewan river. I went to the wye just east of the river and waited. After a few minutes, they started up again and I took this shot of the "Canadian National Railways - Courtesy and Service" logo with the train in the background. It was getting pretty dark by then! I spotted VIA 1722 parked at the station in Edmonton, Alberta. VIA 1722 was built by Colorado Railcar for BC Rail as BCOL 1722 in 2000. It was part of a set of 3, numbered 1720-1722. These cars ran on the Whistler Northwind. You may remember I saw ex-BCOL 1700 recently, the power for the short-lived Northwind. Here's a shot of the VIA station in Edmonton... quite deserted at the time I was there. That slide was shot 16 years ago, on June 11, 1994 in Hamilton, Ontario by Glenn Cunningham. 4223 and 4224 are both MLW C424 units. Clearly HATX 509 used to be a Guilford unit, and in fact it was #314 when it was leased to them. It is a GP40-2.